My choice of practice to welcome the new year today was to meditate using fire as my focus. I love this practice for many reasons. There’s the symbolic aspect of cleansing so appropriate for the New Year. It’s a really tangible and natural anchor which is helpful when you’re sleepy (as I was today). As I only have a fire pit outside, it’s a good excuse to be out in the open air. The intention was simply to stay with my experience of watching the fire; noticing any thoughts, placing them into the fire and watching them disappear. A standard mindfulness of thoughts meditation. In fact you don’t need fire for this meditation, any anchor such as the breath or walking will enable you to put some space between you and your thoughts. Sometimes though, when you let go of all the thoughts keeping your mind busy, that’s when you get to the really good stuff. The insights or creativity that you struggle to connect with in everyday life. The previous year has been quite challenging and I’ve wrestled with a lot of unsettling and difficult emotions. Mothering two small children fulltime has been all-consuming and at times overwhelming. I’ve mourned the loss of my identity and knowledge of who I am and what I’m good at. 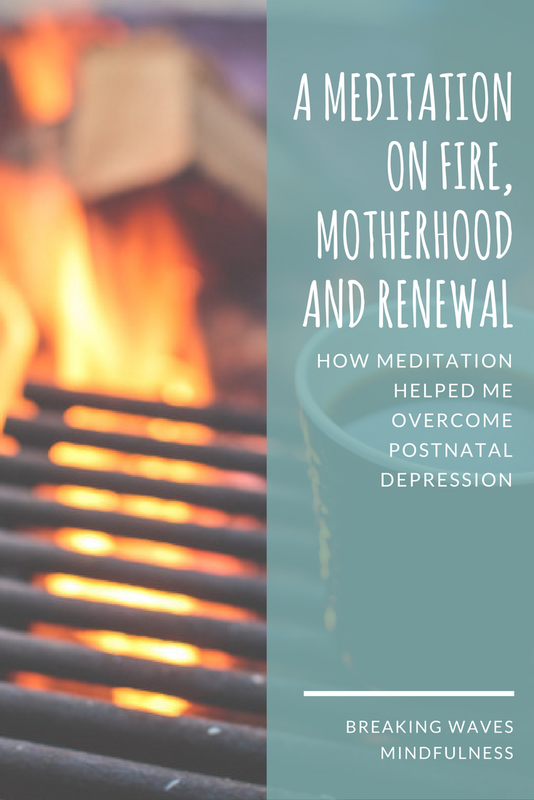 I know I’m not alone in this and there is some fascinating work being done in neuroscience that is identifying the actual changes to the brain when we become mothers and why these big shifts in emotional state occur. You can read more about it here. Whilst these changes to the brain may be necessary and ultimately positive for us, it doesn’t make it any easier to manage at the time. It’s difficult to notice and accept negative and difficult emotions when small children take up so much of our mental and physical space. As I watched the fire I spent some time letting go of the usual stuff. Conversations I had that day, things I needed to do, some regular insecurities and worries etc. As I continued to watch however, I noticed my thoughts being routinely pulled towards a sense of watching my old self be consumed by the fire and I decided to run with this train of thought for a moment. I realised that I’m not simply being consumed by the fire like wood or coal. Instead I am within the fire. Like metal, I am being returned to a molten state to be reborn with new purpose. More empathy, more love and less concern for what others think. I’m not lost, just changing and that makes me hopeful and excited for what is to come. One of the greatest gifts mindfulness has given me is the ability to shift perspective from destructive to hopeful and I will be forever grateful. 2017 is looking good already. I’m so happy to see you have started your blog!! And what a perfect quote to end this post with. I love it. Thank you. You know I love a good quote!